I don’t think there’s a more telltale sign of summer than seeing a child joyfully enjoying an ice cream (or ice pop) on a hot day. Conjure up the image, if you will, of a smiling, stained face, dripping with a grape, orange–pick your favorite flavor–juice down his chin. It’s one of those childhood memories most of us have experienced and now savor as adults. Naturally, it’s why I’m perturbed by another one of these products aimed at parents that errs on the side of caution by robbing kids of the simple bliss of enjoying an ice cream. Pop Pals Ice Pop Holders are billed as an insulated pop holder designed to keep hands warm and ice pops cold. But are they truly necessary? 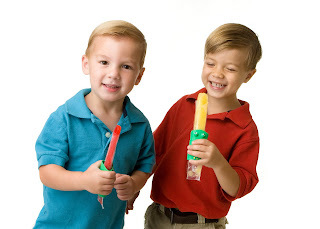 For ice pops that come in plastic wrap and not on a wooden stick, the pop holders slip over them so kids can still enjoy their treat without complaining of icy fingers. To this I beg the question: are we coddling our kids a bit too much by addressing this complaint as something they can’t learn to tolerate? Yes, as a parent, it can surely be easier to find solutions for anything that resembles even a slight discomfort for our kids, but in the end, it’s not the best way to teach them. As the saying goes, into every life a little rain must fall. Or, perhaps more relevant to the season, yes, you’ll get sand in your shoes at the beach and those ice pops might be cold to the touch. But it’s also part of the experience, and if you miss out on that, well, you just might miss out on a great memory. In a Nutshell: Boon, makers of Pop Pals and widely known for their high-end feeding and bath products, strikes out this time. Skip this product and use the money instead on an economy pack of ice pops. That way, you too can enjoy a taste of the season with your child and show them what summer is all about.